OMG Posters! 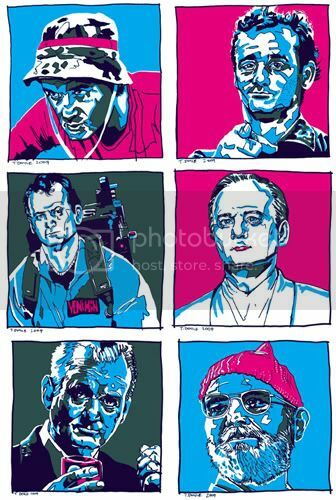 » Archive "Bill Murray Times Six" Art Print by Tim Doyle - OMG Posters! Tim Doyle of Nakatomi Inc. has a new art print for sale, an homage to everyone’s favorite Ghostbuster. 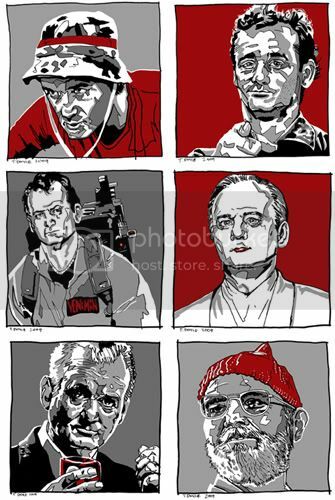 “Bill Murray Times Six” is a 6″ x 36″ screenprint (it’s the wide format below, not the larger stacked shape), has an edition of 50, and is $30. You can also score the technicolor variant, which completely glows in the dark and has an edition of only 10, for $50. Visit NakatomiInc.com. Classic Murray pictures and it GLOWS!! Nice- but where is Big Ernie McCracken from Kingpin? Ugh…tell me about it. There’s SO MUCH MURRAY! It was tricky to narrow down what would fit, and what was iconic. lets see… Caddyshack, Stripes, Ghostbusters, Ed Wood, Lost in Translation, and Life Aquatic? I love Bill. I like the illustration of him with the scotch.